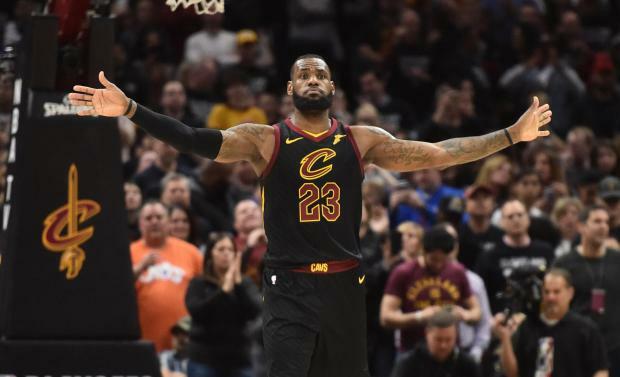 LeBron James scored 45 points as the Cleveland Cavaliers beat the Indiana Pacers 105-101 in the decisive seventh game of their first-round playoff series Sunday at Quicken Loans Arena in Cleveland. The Cavaliers will meet the host Toronto Raptors on Tuesday night in Game 1 of the Eastern Conference semifinals. James, who hit 16 of 25 shots and 11 of 15 free throws, contributed nine rebounds, seven assists and four steals. "I'm burnt right now," he told reporters postgame. "I'm not thinking about Toronto right now until tomorrow. I'm ready to go home. Can we? I'm tired. I want to go home." Tristan Thompson, making his first start of the series, delivered a double-double with 15 points and 10 rebounds. Kevin Love scored 14 points, hitting four 3-pointers, for the Cavs. Cleveland point guard George Hill, who missed the last three games with back spasms, didn't play in the first half but scored 11 points in the final two quarters. Victor Oladipo topped the Pacers with 30 points, 12 rebounds and six assists. Point guard Darren Collison added 23 points for the Pacers and forward Thaddeus Young had 14 points and 10 rebounds. "Nobody thought we were going to be here," Oladipo said. "I feel like we've earned our respect from everyone." Oladipo's driving layup cut the Cavaliers' lead to 100-96 with 50.1 seconds remaining. James' layup pushed the lead to 102-96. After Oladipo's miss, James hit two free throws with 23 seconds left to seal it. The Pacers shot 45 percent while the Cavaliers hit 43.2 percent. The Cavs had a 44-37 rebounding edge for the game. After leading by 11 at halftime, Cleveland's lead was cut to 76-74 after three quarters. James, experiencing some cramping, had gone to the locker room with one minute left in the third quarter. He didn't return until 8:04 left in the fourth quarter with the Cavaliers leading 86-78. "It felt like a Game 7," James said. "It was like, your mind is thinking like, 'OK, besides the two I played in the Finals, you start thinking like, is this it? Could this be it?' That's just human nature. And then the other side of my brain was like, 'Let's go make something happen. Let's go, that's what you here for. You're here to make plays, you're the leader.'" Indiana used an 18-2 run to take a 61-58 lead in the third quarter. Bojan Bogdanovic's 3-pointer gave the Pacers their first lead at 59-58 with 7:13 to go in the quarter. James scored 26 points to propel the Cavaliers to a 54-43 halftime lead. The Pacers sank 54.8 percent from the field in the first half compared to 43.8 percent for the Cavaliers. However, Indiana had eight turnovers while Cleveland had zero in the first half. The Cavs scored 10 points off those turnovers. Cleveland had an 11-2 edge in offensive rebounds, 24-17 in overall rebounds. For the game, the Cavaliers had 12 turnovers, one more than the Pacers. The Pacers used a 10-0 run to cut the deficit to 35-31 in the second quarter before Cleveland rebuilt the advantage. James hit all five of his shots in the first quarter to help Cleveland to a 31-19 advantage after the opening 12 minutes. Thompson had six points and seven rebounds in 11 minutes in the first quarter to give the Cavs a lift. James Harden scored a game-high 41 points, and the Houston Rockets turned a blistering first half into a 110-96 victory over the Utah Jazz on Sunday at Toyota Center in Game 1 of their Western Conference semifinal series. Harden converted 7 of 12 3-point attempts and added eight rebounds and seven assists to his line. After Utah sliced what was once a 27-point deficit to 11 early in the fourth quarter, Harden restored order with three free throws, a 3-pointer and a second-chance basket of his own miss. "He's a special player," said Jazz coach Quin Snyder. "It's hard to give credit to all the things that he does. He just impacts the game in so many mays. You have to try to make it harder for him." Clint Capela recorded a double-double with 16 points and 12 rebounds while PJ Tucker chipped in 15 points on 6-for-8 shooting, including 3-of-5 from behind the arc. Chris Paul tallied 17 points, six assists and four steals for the Rockets, who will host Game 2 on Wednesday night. Donovan Mitchell and Jae Crowder scored 21 points apiece for the Jazz, coming off a grueling, seven-game series against Oklahoma City that concluded late Friday. Joe Ingles added 15 points, six rebounds and five assists while Rudy Gobert totaled 11 points and nine boards but failed to impact the game defensively. The first half offered a glimpse of the Rockets at their very best -- Harden and Paul in particular. Paul masterfully orchestrated the offense in the opening quarter, finding teammates for a pair of assists while also uncovering crevices for his own shot. Paul scored nine points in the first. Harden was even more potent, converting a 3-pointer and driving layup in succession to push the lead to 26-15. By the close of the frame, Harden and Paul had combined for as many points (21) as Utah managed, with the Rockets carrying a 13-point lead into the second. They didn't let up. When Capela followed a Harden 3-pointer with a finger roll after a hard cut to the basket, Houston led 49-29 at the 6:42 mark of the second quarter. Down the stretch of the half, Capela added a dunk before Harden and Tucker combined for three 3-pointers, the second corner trey from Tucker pushing the advantage to 64-37 with just over a minute remaining in the first half. Houston shot 53.5 percent (23 of 43) before the break, including a scorching 10-of-16 on threes. The Jazz mustered better energy in the second half, but the 27-point deficit proved too damaging. "We're different," Harden said afterward. "We've seen so many different defenses throughout this year that have prepared us for this moment."